Rep. Peter DeFazio, D-Ore., (seen above) chairman of the House of Representatives Committee on Transportation and Infrastructure, is planning to hold a hearing on Feb. 26 focused on the links between the transportation industry and climate change and what policy initiatives need to be developed as a result of that relationship – including some of those espoused the “Green New Deal” resolution introduced by Sen. Edward Markey, D-Mass., and Rep. Alexandria Ocasio-Cortez, D-N.Y., on Feb. 7. Rep. DeFazio noted that the full committee – entitled “Examining How Federal Infrastructure Policy Could Help Mitigate and Adapt to Climate Change” – will delve into the role the transportation sector plays in global warming, explore the “dual track approach” of mitigation and resiliency, and learn from experts in the public and private sectors who have demonstrated pragmatic solutions for reducing carbon emissions and building resilient infrastructure. Several of the Green New Deal’s stated 10-year goals align with those issues, including: a commitment to build resiliency against climate change-related disasters; repair and upgrade U.S. infrastructure; overhaul U.S. transportation systems; remove greenhouse gases and reduce pollution through proven “low-tech” solutions. 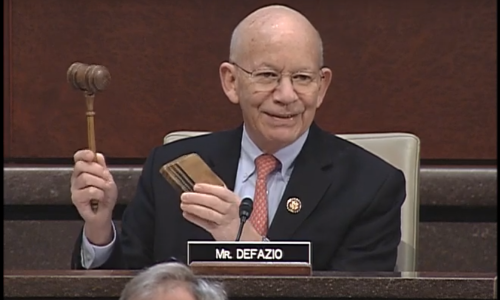 Rep. DeFazio, who has long made climate change one of his key policy issues, also supported the revival of the Select Committee on the Climate Crisis when the Democrats won back control of the House in the midterm elections last year. “There’s a lot of things outside my jurisdiction that relate to transportation that I would be happy to have this committee hold hearings on; it’s a big task,” he explained earlier this year, which includes issues such as improving battery technology and fuel cells.